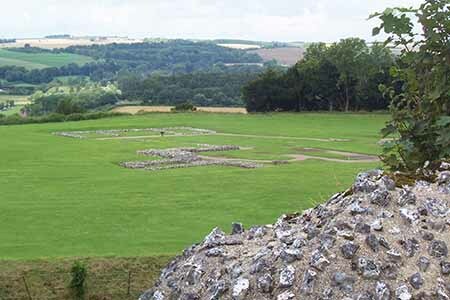 The history of Old Sarum goes back to prehistory around 5000 years. The hillfort itself is from the Iron Age. The area with its abundant water must always have been an important settlement, meeting and crossing place. Definite signs of habitation can be traced to the Bronze Age and the following Iron Age about two miles away from Salisbury. It may well have also been important to the Neolithic people with Stonehenge so close. Hill Forts were built in places where there were excellent views of the surrounding countryside so that any threat to the people of the fort could be spotted quickly. Not too far away the incredible Stonehenge built 3000 years ago shows there must have been an organised habitation of Wiltshire aeons before that. The mind boggles as to how they did build such a massive structure! As one traces one's steps through the history of Old Sarum as told by the site one can only wonder at the intelligence of the ancients. They may not have had all the tools and modern conveniences we have today, it only makes one admire them more. The settlement of Old Sarum and Salisbury's name has changed over time with the people who lived there. Britons called it Kaer Gradawc. To the Romans it was an important and strategic place, their name was Sorviodunum. The Saxons named it Searoburh after they won their battle with the Celts here. In their language burh or burg is Saxon for borough. These burh's were often fortified hill forts either pre exisitng like Sarum or new ones. 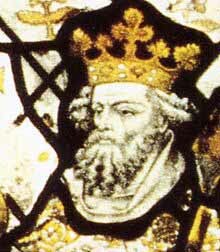 King Alfred the Great converted or built many of them in his defence of Wessex against the Vikings. Sarum can be an offshoot of Saer/Sar - the 'um' is probably to do with Latin script. Under Saxon rule the place was very important both as a secular and a town with religious foundations. It is thought that King Egbert of Wessex spent a little time here during the early 800's. This is quite possible. Like others before him he would have found the Iron Age hill fort an excellent place the view the surrounding countryside. With the ancient major crossroads it was he would also have been able to strike out to where he needed to be in his campaigns, as did King Alfred after him. A century later King Edgar of Wessex was finding the Danes in the north a little troublesome and he convened a national council here to map out a collective answer to the problem. With the Normans it became Seresberi and from their Doomsday Book it is getting more modern with Salesberie. Like others before them they realised the significance of this important crossroads and it was one of the first places to which William the Conqueror came. The Castle was built at Old Sarum by the Normans around 1069. A Cathedral and Bishop's Palace followed. That castle must have been seen as a secure place because Eleanor of Aquitane was kept a prisoner there by her husband Henry II for many years. Arguments between the Castle and Cathedral groups caused the Cathedral to be relocated in the valley of The Avon on land belonging to the then current Bishop, Bishop Poore. So Salisbury was born. The Castle stayed important into the 1300's. but gradually became less important as the city of Salisbury grew. Eventually it became uninhabited. These days it is an English Heritage site and open to the public. The site's history can be traced through the many graphic explanation boards that dot the site. It is a popular spot for a day out and a picnic. Your dog is allowed on the site, but on a lead. There is a shop but no cafe. However there is a vending machine for snacks and drinks. Or may be you might like to browse some more, please do. There are navigation buttons above on the left. Old Sarum is owned by English Heritage. As opening times vary throughout the year please check the link above. Makes a wonderful day out. Plenty of panels that explain the site. Take a picnic and your camera!